Montana is 150,000 square miles, about a third of it national forest. In all that space, is there room for logging? Most say, heck yes. That practical, open-minded, can-do attitude is behind the Forest Jobs and Recreation Act. Montanans are served best when we put ideological battles aside and focus on solutions. The bill is a made-in-Montana effort that will protect the best of the best hunting and fishing habitat in western Montana, repair old scars on the land, while providing loggers and local sawmills with jobs that protect forests, improve habitat. Along the way, the bill provides the mills some stability to help navigate and escape the current economic hard times. The bill has broad public support, including small local sawmills, solution-based conservation groups like the Montana Wilderness Association and Sportsmen’s groups like Hellgate Hunters and Anglers, Montana Wildlife Federation, Trout Unlimited and Backcountry Hunters & Anglers. But what does it mean for Montana sportsmen? Good question. Sportsmen should take serious look at the Forest Jobs and Recreation Act (FJRA) because it will address some of the most pressing issues facing Montana’s Great Outdoors. So where does FJRA apply? Basically, it covers three different parts of Montana: The Three Rivers District of the Kootenai National Forest (also known as the Yaak Valley;) the Lolo National Forest near Ovando, in the Clearwater Drainage; and the Beaverhead-Deerlodge National Forest, which sprawls over southwestern Montana. Why these three places? They share one thing in common. Locals and folks who love and use these places got together, neighbor-to-neighbor, to break through past deadlock so prevalent in national forest management. Sen. Tester saw those local, broad-based efforts, and wrapped them in to one bill. All this country is important for hunters and anglers, but the biggest deal is the Beaverhead-Deerlodge National Forest. This is the largest national forest in Montana. Roughly a third of the elk harvested in Montana come from in or near the Beaverhead-Deerlodge. When people say they’re elk hunting “down around Dillon,” they most often mean the B-D. The Beaverhead-Deerlodge is also the headwaters of some of Montana’s most storied and famous trout fisheries — the Bighole, Ruby, Beaverhead, Madison. These are the rivers featured in the calendars and catalog covers. So it’s a small wonder this bill has caught the attention of sportsmen. So what does the bill actually do? 1) it protects the Best of the Best. 2) it repairs scars on the land. 3) it sics loggers on buggy lodgepole pine. First, let’s talk about protecting the best of the best. Yes, the bill protects wilderness areas. It does not “create” wilderness. Rather, it identifies lands that Montanans have long said should remain pristine and natural and protects them under the Wilderness Act. These areas are important as sources of cold, clean water for downstream trout fisheries. They are also great places for backcountry hunting and fishing. Of course, some folks prefer hunting near their rigs and a handy road; but for folks who seek solitude and big, wild country, these places are priceless and irreplaceable. So what places would be protected as wilderness? 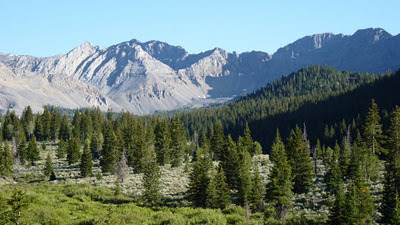 In the Beaverhead Deerlodge, it includes the Snowcrest Range, Italian Peaks, the high country of the West Big Hole, the East and West Pioneers, the Sapphires and the Highlands. The bill will also make some additions to the Mission Mountain Wilderness and the Bob Marshall Wilderness Complex near Ovando. Up the Yaak, the bill will protect Roderick Mountain, the biggest and least developed mountain in this lush, inland rain forest. Those places provide great security habit for bucks and bulls to reach their breeding and trophy potential, and under this bill they will continue to do so. Now, a lot of our national forests are not pristine. Let’s face it — we’ve learned a lot about how to extract natural resources over the past 100 years by doing it wrong. We used to run logs down the river, and blow up logjams with dynamite. We used to use Idaho Jammers to skid logs, with roads every 100 feet, blocking streams with poorly placed culverts. We used to use placer and dredge mining and other destructive practices in search of gold. Those kinds of practices left scars on the land that can take centuries to heal, or might never mend if left to nature. But the Forest Service has rarely had funds to address those problems. In the past, the Forest Service sold timber to sawmills, but the revenues largely went back to the Federal Treasury. This bill would create stewardship contracting. This is an entirely different way of managing the forest. Instead of selling trees and sending the revenues back to the Beltway Sinkhole, the money is re-invested right on the land. Stewardship contractors direct land managers to maintain trails, restore impassable roads we need and zip up and put to bed old skid roads and jammer roads that are long since obsolete. This has a lot of benefits for hunters and anglers. We finally have tools to repair old slumps and blowouts that impair trout streams. We can improve elk security habitat – and thus improve hunter opportunity – by restoring habitat. The work is out there, waiting to get done. Contract stewardship gives the Forest Service new tools to do it. Much of southwestern Montana is blanketed with lodgepole pine, grown in the wake of massive forest fires of a century ago. Lodgepole pine is a relatively fast-growing tree. Particularly in times of drought, it’s prone to bark beetles and forest fires. Foresters say the pine stands of 100-year-old trees are basically on borrowed time. Now, elk hunters know that nasty, thick “dark woods” full of blow-down, jackstraw, dog-hair are the kind of places elk go to hide when hunting pressure heats up. No doubt, acres and acres of those kinds of forests will continue to remain on the landscape. That’s good, since elk need places to hide. But elk also need forage. Dark woods provide little in the way of elk forage. We can create elk forage with light-on-the land logging techniques that open the forest to the sun, and allow shrubs and grass to thrive. Better forage equates to better birthrates for does and cows, and improved survival for fawns. Buggy old lodgepole pine can also be prone to forest fires. That’s a natural process, to which lodgepole pine is superbly adapted. But the fact is, people don’t want big, crown fires to rip through their homes, communities and ranches, for some very good reasons. We will always have some forest fires in Montana, but perhaps we can make them a bit less dangerous and destructive to private property. Plus, that pine can be put to good use, creating jobs in the woods and in the sawmills and providing 2 x 4s and other wood products. Local small, family sawmills say have the markets for the final product, if they had a bit more raw material. The bill does more, too. There are local provisions for conservation areas that are not formal Wilderness Areas, but emphasize backcountry recreation. There are other provisions for studying ATV routes and allowing snowmobile recreation areas. You can find the details at www.montanaforests.org. Now, some people do not like the Forest Jobs and Recreation Act. The loudest voices seem to come from folks who do not want another acre of Wilderness Areas protected, period, or who do not want another tree logged, period. No bill is perfect. If I were King of the World, I might have written some parts differently. But that’s not the point. The point is, Montanans can find real solutions when everyone gets to the table and tries to get something done. It’s a damn sight better than what we’ve seen over the past several years: stalemate and gridlock. Ben Long is co-chairman of Backcountry Hunters & Anglers, which supports the Forest Jobs & Recreation Act as it works to pass on America’s hunting and fishing traditions. Great plain and simple explanation on the Bill, thanks for taking the time to put in terms that held my attention. Cheers. Jobs in the woods is an important objective, so long as the woods can survive the jobs. I am concerned about the number of acres mandated to be "treated" by the bill. Can someone explain the safeguards for the forests under this regime? Does the bill require the majority of treatment to be "stewardship" and not plain old clear cuts? Right now, there is no guarantee against clear cuts on any USFS lands in Montana. That wouldn’t change if the Forest Jobs and Recreation Act were to pass. No doubt, we’ll still have projects that propose clear cuts (probably modest) and those that don’t. Just like today. What would change if this bill were to pass is that citizen advisory committees would be legally mandated. Which means collaboration wouldn’t just be a choice; it would be required. Read it closely. It’s a mandate for restoration. That’s something we’ve NEVER had before in Montana. And it’s something we badly need.